Southern Illinois University Edwardsville’s Chloe Huelsmann, a senior majoring in civil engineering in the School of Engineering, is being honored by the Lincoln Academy of Illinois for her leadership and service, and overall excellence in curricular and extra-curricular activities. 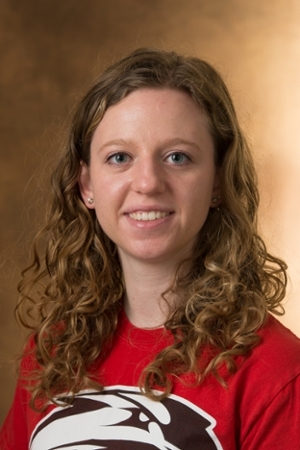 Huelsmann, a native of Alton, will receive the prestigious Student Laureate Award on behalf of SIUE during the annual Student Laureate Award Ceremony on Saturday, Nov. 12 in Springfield. The award recognizes Illinois’ most outstanding students and is presented to seniors from each of the state’s four-year, degree-granting colleges and universities, and one student from Illinois community colleges. Along with achieving notable academic success, Huelsmann has been highly involved and held leadership roles in such organizations as Engineers Without Borders, Society of Women Engineers, American Society of Civil Engineers, Chi Epsilon and Juggling Club. She also served one term on the Teaching Excellence Award Committee. Huelsmann becomes the third School of Engineering student to receive the award in the past five years, following in the footsteps of Jessica Thompson (2012) and Christopher Branch (2013). The state’s student laureates receive a Student Laureate Medallion, a $1,000 educational grant and a certificate of achievement. Photo: SIUE’s Chloe Huelsmann, a senior majoring in civil engineering, and recipient of the Student Laureate Award.